Announcement LKS Originals Offers Handcrafted Artisan Jewelry, Orgone Energy Jewelry, Gemstone Jewelry, Custom Jewelry, Fashion Necklaces, Bracelets, Watches, Earrings and more on Etsy! Welcome to LKS Originals! Within this little shop you'll find treasures to last a lifetime! We offer custom and one of a kind Artisan jewelry designs lovingly handcrafted of natural gemstones and sterling silver, as well as our signature collection of Orgone Energy Jewelry. Want something special that you don't see here? I love custom orders! Just contact me with your ideas and I'll create a beautiful one of a kind treasure just for you! LKS Originals Offers Handcrafted Artisan Jewelry, Orgone Energy Jewelry, Gemstone Jewelry, Custom Jewelry, Fashion Necklaces, Bracelets, Watches, Earrings and more on Etsy! I love my amazing, and very beautiful, ring! Thank you! Nia Peeples as Pam Fields in "Pretty Little Liars"
Dennis Quaid, Brooke D'Orsay and Beth Grant loving LKS Originals at GBK's 2013 Primetime Emmys Gift Lounge! Ben Schwartz and Josh Lawson, of Showtime's "House of Lies", loved my bracelets at GBK's 2013 Oscars Gift Lounge! I love all things handmade, and arts and crafts have always been the way I express my creativity. My husband and I raised 4 beautiful children, and when they were little we were always doing creative craft projects together. The Christmas tree was always full of the ornaments and trinkets that we made. I first went into business selling my crafts when the children were little and I literally couldn't afford to work outside the home. (After all, who could pay for daycare for 4 children!) I made what we all called "dough-bears" - little teddy bear ornaments and figurines made of salt dough - what fun! The business did well for quite a few years, and enabled me to stay at home with my babies and contribute financially. I discovered polymer clay and the dough-bears became clay-bears, and I found that I could sculpt so many more intricate and tiny things - one of my loves is miniatures - so I was really excited to have this clay to work with! For years our friends and family received gifts of dough-bears and clay creations for the holidays, birthdays, etc. I adore mosaics as well, but have never sold them. I can't part with a single piece once I'm done with it, so I have lots of great mosaic pieces around the house...LOL! Pretty soon I was making necklaces, bracelets and earrings not only for myself but for friends and family who saw and loved what I was wearing! I soon opened my Etsy shop, and a few months later, quit my day job and jumped in with both feet, and haven't looked back. My jewelry line continues to expand as I learn new techniques - this is just so much fun! I taught myself how to wire wrap so I could make a pendant out of a very special stone that a very special person gave me. Now friends are hiring me to wrap their stones...pretty cool. I'm super excited about my newest line, Orgone Energy Jewelry. These pendants, bracelets and earrings are really unique and beautiful, and they carry the power of positive energy and protection. 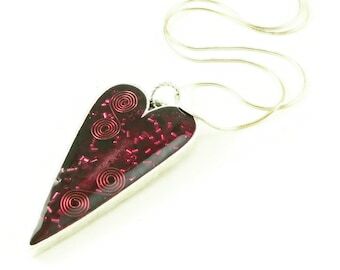 Orgone Energy Jewelry started out as a little experiment and has quickly become our signature line. You've GOT to check this stuff out! 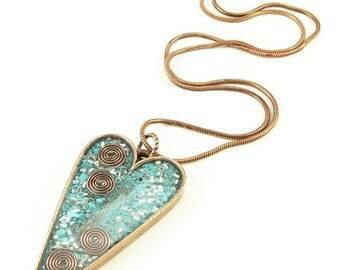 I'm a proud member of a celebrity gifting organization called The Artisan Group. This is an amazing and supportive group of talented artisans. So far I've had the opportunity to gift Renee Zellweger, Brandi Glanville, Khloe Kardashian, Tyra Banks, Amy Poehler and Nia Peeples (She wore the custom necklace I gifted her on an episode of ABC Family's Pretty Little Liars!). I've also had the opportunity to participate in the GBK celebrity gift lounges for the 2012 and 2013 Primetime Emmys, 2012 Country Music Awards, 2013 Academy Awards, Earth Day 2013 and the 2013 Cannes Film Festival. In my mission statement for LKS Originals I wrote that Oprah Winfrey would wear and love one of my pieces, so maybe these opportunities will help make that happen! Thanks for visiting. I hope you'll browse around and enjoy your stay here in my little shop. I wish you love, peace, joy and all good things - always! Hi there! I'm Lisa, owner and founder of LKS Originals. Jewelry making is definitely my "zen" thing! I love the energy and power of gemstones, and they are by far my favorite items to work with! I'm all about organic, rustic, bold and vibrant!